First and foremost, please be reminded that your reservation has been cancelled and you were never charged for same. Unfortunately, your reservation was not honored by the resort due as a result of a Group Travel issue, which is a clear violation of the Terms and Conditions governing the vacation package. We contacted you as soon as a connection was found between you and one or more other parties traveling to the same resort on the same dates and you decided to change resorts. The issue arose again when one of the previously identified parties also moved to the same resort. Although we thank your husband for his previous military service, you indicated to one of our representatives that he currently works for Comcast, which is not a violation of the Terms and Conditions. The Terms and Conditions governing every promotional package are located at the bottom of each resort offering page and are easy to read and understand. In addition, the Terms and Conditions are reviewed with the customer during every sales call, and must be agreed to in writing by every customer in order to finalize the reservation and have dates sent to the participating resort provider. 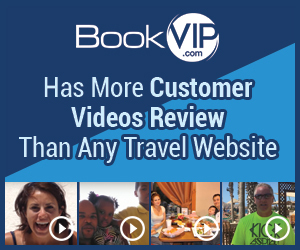 We have an A+ rating with the Better Business Bureau and send over 100,000 people on vacation per year and have more customer video reviews than any other travel site. I went on Bookvip because we heard so much about Westgate in orlando we actually thought about buying timeshare. When the opportunity came for us to take a small vaction BookVip came on my facebook page. So I went to reserve and low and behold 4 days later is when the horror began. I recieved a email for me to call and when I called they let me know that someone who I didnt know was traveling to the same hotel and i needed to cancel my reservations. So I ended up caneling and reserving for another Westgate resort and here I go again another email anothe persons at the same hotel. When i told them that my husband was retired military they said we couldn't book. I felt like they were being prejudice against me and they have my card information and here today i still have no reservations. I recieved a call today and still no reservation. My vacation was planned for the first week in April and its ruined because this has taken so long. Review #808515 is a subjective opinion of User808515.